Probably the main reason I touched upon this novel was because it was for school reading. 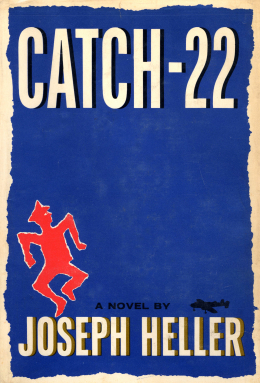 But that doesn’t change the fact that Catch-22 is one of the most “quirky” and intriguing novels I’ve ever read. Though, that’s not really saying much, considering my aversion to reading complex novels. Compared to the Scarlet Letter or Huckleberry Finn, it’s set a lot closer to our time. And it’s not a novel that’s only interesting because of Sparknotes and other analyzing sites. While it’s still about sixty years off, the ideas and themes conveyed are still very powerful. Joseph Heller’s most well known novel drew attention away from his other works, but it’s not without good reason. The protagonist, or “hero” of the novel is the Air Force Bombardier Captain Yossarian. His primary motivation through the course of the story is self-preservation. And who could blame him? There seems to be little motivation for risking lives other than to show an example of heroic sacrifice. His main opposition is the ambitious Colonel Cathcart. In order to impress his superiors, he continually raises missions which only prolong the pain that Yossarian and the other officers of his squadron endure. Since the events in the novel are in anachronistic order, we get glimpses of the present and past events. Yossarian is revealed to be more brave in earlier parts of his combat duty before a gruesome event changed his life. There are a great deal of characters, but only a few get much development. Or focus that covers more than one chapter. We see the multiple motivations, forces, and decisions at work; profits, military power, idealistic future lifestyles, etc. For example, Yossarian’s close friend Milo Minderbinder may seem nice, but his drive for making profits has repercussions for others. Meanwhile, Yossarian’s absentminded friend Orr irritates and endears Yosarrian and seems to consider him his only friend. The idealistic Nately, the fun-seeking Dunbar, parading Lieutenant Schieskopff, innocent Chaplain, and many others serve as the “ragtag group” that we come to love, or despise. Yossarian is selfish but relatable, and compared to many other characters, a moral center. He’s aware of the atrocities that the war creates and eventually develops deeper reasons to pursue his self-preservation. Even though the war is near its end, the fighting is still very much a reality; soldiers are losing their lives relatively easily while manipulative officers remained unharmed and concerned for their own reputation. In a sense, the novel’s setting is like 1984. Military officers continually strive for more power. The main rule of the story that controls everything is Catch-22, a ludicrous, horrific, indescribable policy that allows officers to have their way. The first example is the method of getting taken off combat duty. To quote the novel, “You have to be insane to be taken off of combat duty. You can’t be taken off the missions unless you ask. But If you ask, it proves that you’re sane, thus ineligible for being grounded”. But even though the antagonists are only human, there’s nothing that can be done. Because Catch-22 isn’t set in a futuristic(relatively speaking) dystopia, it’s arguably even more frustrating and cruel. There’s some deliberate exposition that’s voiced in a humorous fashion, or points are reiterated. Deja vu to be exact. Things that may initially come across as humorous take a darker tone in later parts of the novel. It is admittedly a fairly long novel, with events scattered all over. It will probably take a second reading or a deeper discussion to truly appreciated Catch-22.